If you are a new or first-time grandparent, you’re in good company. According to the MetLife Report on American Grandparents, by 2020 one in three American adults will be a grandparent. No doubt you’re thrilled to be called Grandma or Grandpa, Nani or Poppie, Bubbie or Zaydie (or – like one spry duo of my acquaintance – Bubbles and Zany). At the same time, it may still come as a bit of a shock. Just yesterday you were pushing your own babies in their strollers – and now those babies are having babies. Clichés like “it all goes by before you know it!” – turn out to be absolutely true. What no longer rings true, however, is the classic image of America’s grandparents, as depicted in the Norman Rockwell-style tableaux: silver-haired, elderly white folks wiling away their days in their front-porch rockers, waiting for all the kids and grandkids to converge after church for a home-cooked Sunday supper. It’s possible that this stereotype never fit your family of origin to begin with, as it contains few of the flavors found in the stewpot of 21st-century America. Or maybe it describes your own grandparents right down to their steel-rimmed bifocals and walking-sticks. Except they were so OLD! You may be (like I once was) a grandparent barely into your fifties, or even younger – still in the workforce, running half-marathons, with other children, teenagers, still living at home. Or even if you are a senior citizen, you’re much too active and attractive to think of yourself that way. If so, you’re one of the lucky ones. Plenty of older adults don’t feel very spry at all; taking grandchildren to Disney World isn’t in the realm of possibility. Regardless of chronological age, no one is immune from chronic illness or worsening disability, financial downturns, caregiving responsibilities, or other harsh realities. Notwithstanding your circumstances, or what “the other grandparents” can do: you have priceless gifts to bestow upon the grandchildren who look up to you – whether you’re sharing a rafting trip down the Colorado River, or a Hershey bar at your kitchen table. That is the essence and the beauty of this singular relationship, whose sweetness will brighten your days. One thing for sure: wherever you fit in the pantheon of contemporary grandparents, the very definition of what an American family looks like, has changed dramatically from what it was even twenty-five years ago. The wheels of change are turning more rapidly than we could have anticipated, and we are all holding on for the ride. The stabilizing force of extended family – for every kind of family – is more important than ever. 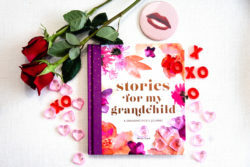 Reproduced with permission from The Grandest Love: Inspiring the Grandparent-Grandchild Connection. If you enjoyed this story, please subscribe to the HoneyGood.com email list. Once a day, when we post a new story, you will receive it in your inbox. SUBSCRIBE HERE. If you have something to say about this story… let’s talk! We want so much to hear your opinions + feelings. Share your comments below or on Facebook, Twitter, and Instagram.